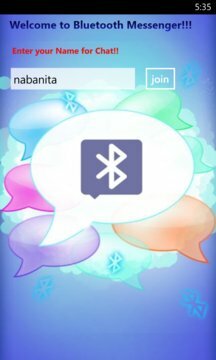 Chat without Internet Connection!!! Yes! Say No to Internet Bills! Too lazy to go to next door or walk up to your work-mate or bored in boring classes? 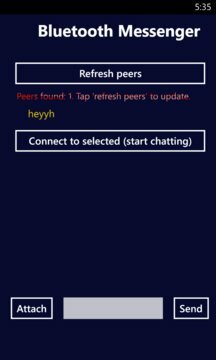 Just Login in with a random name and start chatting! Now this is no rocket science! It uses Bluetooth app-to-app Technology. Just keep your Bluetooth on and you are good to go (works within the Bluetooth range of your phone). Enjoy, download, keep chatting! And don't forget to refresh peers, every time you log in.